Croatian born artist, Joseph Zbukvic is a formidable watercolourist, with over two hundred awards under his belt. Now resident in Australia, he regularly travels abroad, adding variety and vitality to his work. 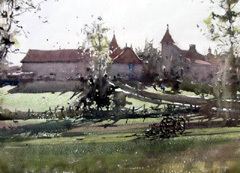 For his film, Rural France in Watercolour, he visits the Dordogne, to explore its beautiful countryside. He starts by discussing his equipment, including his highly desirable work box/easel. Designed by himself, to hold paints, paper, and brushes, it’s sadly not available for purchase. I’m sure he would sell thousands! His first painting features a small chateau, in hazy sunshine. Zbukvic discusses how he moves a few elements around to create a better composition, and has a fairly detailed drawing in place before he starts painting. He looks for a unifying tone that runs through the composition to pull it together. He doesn’t identify precisely which colours he uses, as he feels it’s an insult to nature to reduce colours to chemical or commercial names. He works more intuitively, sometimes picking up colours he has previously used, already mixed on his palette. Brantôme is his next stop, where he paints buildings running along the river towards an old bridge, bathed in late afternoon sun. He draws this more complicated structure out carefully, emphasising the few darks to define the form, and also adds shadow that has yet to arrive, to strengthen the composition. As a complete contrast, he then uses his experience as an equine artist to complete a quick study of a dressage rider on a farm, putting her horse through his paces. His final two paintings include a corner of a market, where he endorses his advice to students to simplify in order to create a stronger image, and a tranquil lily pond. 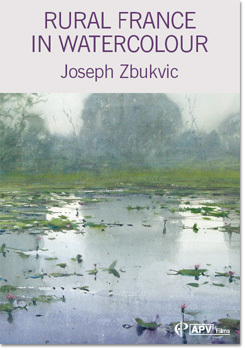 This immediately evokes Monet’s huge canvases and Zbukvic acknowledges the master, but explains why such a subject poses a particular challenge to a watercolourist, with its strong contrasts of darks and lights on the water. He adds a graduated wash that creates a beautiful water surface, and plays down the background, flattening it, so as to not draw attention away from the lake. He impressively suggests perspective across the lake, and after adding touches of pink for the flowers, he drops in the reflections on the water. All in all, this is a highly informative, enjoyable and inspiring film. Joseph Zbukvic also likes to travel, and his wonderfully atmospheric paintings have won him acclaim around the world. 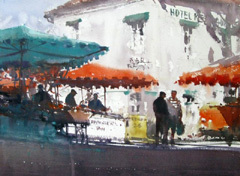 In Rural France in Watercolour he visits the Dordogne region, where he finds five contrasting, challenging subjects. While we may not be able to fully emulate Joseph's dancing, telling brushstrokes, they are certainly an inspiration. And he offers plenty of useful tips, perhaps the most important of which is to start with a sound drawing. Joseph is a genius. Never tire of watching him at work. Well, you don't really need to see this new DVD of Josephs to comment. You know from seeing his other films that every new production is going to as good if not better than anything you've seen previously. Well done Joseph and to APV, you've done it again! I have all of Joseph's DVDs but this one for me is the best. I love the rural themes throughout and Joseph seems to be really relaxed and enjoying being surrounded by such beautiful scenery. It is a pleasure to watch. Well done Joseph and congratulations to APV.